Trivia: Director Todd McCarthy had hoped to include an interview with legendary cinematographer, John Alton, but could not locate him. Alton had quit the movie business, and for many years, even close friends didn't even know if he was still alive. In 1992, McCarthy received a phone call from the now 91-year-old Alton, who had heard about Visions of Light, and wanted to attend the premiere. In the beginning, there was a guy with a camera. This is one of the first observations made in Visions of Light, a documentary produced by the American Film Institute, which focuses on the cinematographer's contribution to the art of motion pictures. It is a contribution that stretches back to film’s earliest days. Before there were actors or directors, before there were sets or costumes, before there was any commerce at all attached to the medium, there was a guy with a camera, capturing images he felt were important. From these humble beginnings, the greatest art form of the 20th century was born. Visions of Light is as complete a documentary on the subject as could possibly be produced. It begins in the days of the silents, when cameras, unencumbered by sound equipment, could roam freely, and carries us through to modern times, with today’s experts recalling the precise moment they fell in love with images on film. Visions of Light reviews the work of the pioneers, men like Gregg Toland, whose genius was the driving force behind the technical innovations of Citizen Kane. Director Orson Welles was so indebted to Toland that he paid his cameraman the highest compliment, listing Toland's name in the closing credits alongside his own. Of course, directors aren’t the only ones who relied on the skill of the cinematographer; the performers had their favorites as well. Greta Garbo arguably one of the biggest stars in motion picture history, demanded that William Daniels work the camera on all her films (Daniels would shoot 21 of the 24 she made between 1926 and 1939). In Visions of Light, we learn a great deal about the men and women whose names are not entirely foreign to film fans, yet not entirely familiar, either. Cinematographers such as James Wong Howe (Picnic, Sweet Smell of Success, Hud), Conrad Hall (Cool Hand Luke, In Cold Blood, American Beauty), Vilmos Zsigmond (Deliverance, Close Encounters of the Third Kind, The Black Dahlia) and Gordon Willis (The Godfather, All the President’s Men, Manhattan), whose profession seldom allowed them to step into the spotlight, but whose contribution to the art form is immeasurable. 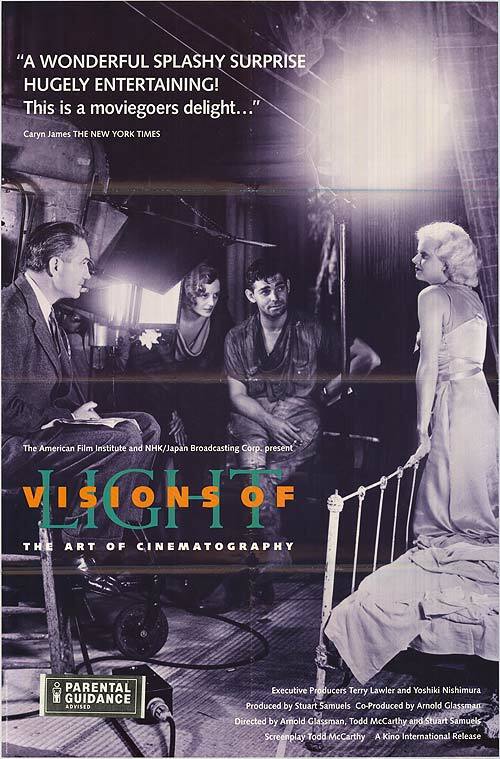 Visions of Light is a must for film fans, whether they be obsessive or merely casual. It is a chronicle of the men and women who guide our line of sight, focus our attention in the exact spot it must be focused, and ultimately capture the images we have grown to love. Visions of Light reminds us of this, and all that the cinema owes to these individuals. It's a debt so large, I fear it could never be repaid.